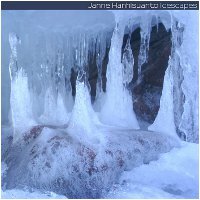 Earth Mantra is very happy to welcome Finnish ambient composer Janne Hanhisuanto to our humble netlabel, with his beautiful new album Icescapes. We have a real treat in store for you with this release, which is a collection of smooth and utterly gorgeous ambient tracks. Ranging from tranquil synthesized tone poems, to gentle acoustic piano pieces, to pulsing electronic compositions, there is truly something for everyone in this exquisite album. As one might surmise from the title, the music in Icescapes was inspired by water in winter; icy cold, white and mysterious atmospheres, natural ice sculptures, and enigmatic marks in snow all inspired Janne to compose this succulent music. He also intentionally 'warmed up' the music towards the end of the album, to evoke the emergence of spring, as "ice melts, snow melts, water starts to run, and outside temperature is increased". A very nice touch. Janne reports that Icescapes is the first in a series of "water movements" releases that he has been pursuing, with the second release currently under construction. He is also considering a related video installation, a collection of pictures and videos combined with the music, another work in progress. We are very excited by these concepts and hope that he shares these with us as he develops them. We are particularly struck by the strength of the compositions. As if the sheer opulence of the sounds was not enough, this is music that one can really sink one's teeth into. The melodies are achingly lovely, the chord sequences are fresh and mature, and the evolution of the pieces combines both elements of traditional structure and modern serialism. Really, really well thought out music. And so we are very proud to introduce Janne Hanhisuanto to the Earth Mantra audience, and are very inspired by Icescapes, his latest masterwork. An outstanding album that is a must-hear for anyone who appreciates soothing, tonal ambient music, and one that certainly should be counted amongst the top light ambient albums of 2010. Played on Star's End Radio on July 25, 2010. Played on Ultima Thule on July 18, 2010. Read the Star's End review here. Congratulations Janne!